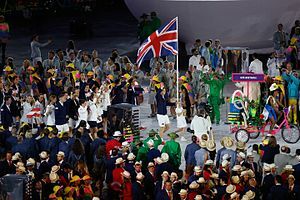 These Games were the most successful for Great Britain since 1908, winning a total of 67 medals, which exceeded its London 2012 tally of 65 medals, therefore becoming the first nation to surpass its medal total at the Olympics immediately following one that it hosted. Great Britain also became one of only two nations (the other being Azerbaijan) ever to increase the number of medals achieved in five consecutive Games. In cycling male cyclist Jason Kenny become only the second British athlete since 1908 to win three gold medals at the same Olympic Games to join Sir Chris Hoy as the most successful all time British Olympians with six gold medals and a silver, while gold for Sir Bradley Wiggins confirmed him as the most decorated British Olympian, with eight medals (five gold) over five Games. Kenny also became the sixth British Olympian to win an Olympic gold in the same event (men's team sprint) at three successive Games, joining three pre-war water polo players Paul Radmilovic (1908-1920, interrupted by the cancelled Games of 1916), George Wilkinson and Charles Sydney Smith (both 1904-1912), rower Steve Redgrave (in men's coxless pair from 1988 to 1996)) and sailor Ben Ainslie (in the Finn class between 2004-2012). Kenny was immediately followed onto this list by a seventh 'three-peat', fellow cyclist Ed Clancy, who sealed his third consecutive team pursuit gold medal. Indeed, Clancy and Kenny, along with American road cyclist Kristin Armstrong (in women's time trial) became the first three cyclists to ever achieve the feat. Cyclist Laura Trott also won two gold medals to become Britain's most successful all time female Olympian with a total of four golds, dressage rider Charlotte Dujardin having briefly taken that title with three golds and a silver from previous incumbent cyclist Victoria Pendleton. Katherine Grainger's fifth consecutive medal, a silver, made her Britain's joint most decorated female Olympian, with Kathleen McKane Godfree and made her one of only five British Olympians (with Sir Steve Redgrave, Sir Ben Ainslie, Sir Bradley Wiggins and Jack Beresford) to win medals in five Games running. Gymnast Max Whitlock won Britain's first ever gold medals in gymnastics, in men's floor and pommel horse, while Great Britain's seven gymnastics medals, a record for the team, included first ever medals in men's individual all-around (also for Whitlock), men's horizontal bar for Nile Wilson, women's floor, for the youngest member of the team, 16 year old Amy Tinkler and trampoline for Bryony Page, while pommel silver medalist Louis Smith became the first British gymnast to medal across three Games. In rowing, Britain took gold in both the men's coxless four and the men's eights for the first time since 2000, as well as a first ever medal for the women's eight, a silver. Pete Reed and Andrew Triggs Hodge in the eight won their third successive gold medals, having won double gold in the four in 2008 and 2012. Alistair Brownlee became the first triathlete to successfully defend an Olympic title and his younger brother Jonny Brownlee upgraded his London bronze to a silver in the men's triathlon, one of three events with the men's pommel and men's individual sprint where Great Britain finished first and second. No British woman having ever defended an individual Olympic title, Trott, Dujardin, taekwondo-ka Jade Jones and boxer Nicola Adams became the first four British female Olympians ever to successfully defend individual Olympic titles, with Trott becoming the first British female, and fourth Briton with Mo Farah, Chris Hoy and Jason Kenny to successfully defend two Olympic titles at the same Games. In athletics in both the men's 5,000 and 10,000 metres Mo Farah successfully defended his Olympic titles to become Britain's most successful ever Olympic track and field athlete with four golds between 2012 and 2016, while Christine Ohorougu, despite failing to reach the 400 metres final, became the second British track and field athlete, after Steve Backley, to win medals in three successive Games anchoring the Great Britain team to bronze in the 4 × 400 metres relay. In swimming Adam Peaty won gold in the 100 metres breaststroke, the first British male swimmer to win gold since 1988 and also won silver in the 4 × 100 metres medley relay. James Guy, Duncan Scott and Jazz Carlin each won two silvers, the men in the medley relay and the 4 × 200 metres freestyle relay, Carlin in the 'distance double' of 400 metre and 800 metre freestyles behind Katie Ledecky. The six medals was the nation's largest in-pool haul, and was supported by seven separate 4th-place finishes in the pool. The pair of Jack Laugher and Chris Mears became Britain's first Olympic diving champions in the 3 metre synchronised springboard event, while Tom Daley became the first British diver to medal in multiple Games, despite missing out on the 10 metre platform final, with bronze in the 10 metre synchronised platform event. Great Britain won their fifth consecutive gold medals in both the men's coxless four and from Giles Scott in the Finn sailing class, while Nick Dempsey became the most decorated windsurfer in Olympic history with his third medal, a silver. In the first Olympic men's golf tournament for 100 years, Justin Rose won gold on the final hole after a close contest with Ryder cup teammate, Henrik Stenson of Sweden. There was also some success for Great Britain in team sports when in the first week of competition Great Britain captained by Tom Mitchell won silver in the inaugural men's rugby sevens tournament after losing to Fiji 43-7 in the gold medal match and in the second week Great Britain captained by Kate Richardson-Walsh went unbeaten and won the country's first gold medal in a team sport at a Summer Olympics for twenty eight years when they beat the Netherlands in the gold medal match 2-0 on penalties after the match finished 3-3 at full time in the women's field hockey. In all, Great Britain, while finishing second in gold medals to the United States, and third in overall medals after the United States and China, won gold medals across more different sports than any other nation at the Games. Great Britain also topped the medal tables in cycling, sailing, triathlon, golf and rowing, and won first ever golds in golf, diving and gymnastics. The following Team GB competitors won several medals at the 2016 Olympic Games. On 29 April 2014, the British Olympic Association announced the appointment of Mark England as Chef-de-Mission to the British Olympic team at Rio 2016. As with previous games, UK Sport was the body responsible for allocating elite funding for Olympic sports. In December 2012, a record £347 million of funding for Olympic and Paralympic athletes was announced with the aim of becoming the first nation in recent history to win more medals at the Games following being the host nation. Four sports, basketball, synchronised swimming, water polo, and weightlifting, initially had all their funding withdrawn, while swimming and badminton had their funding cut. Following an appeal process weightlifting had its funding restored. The Sport and Recreation Alliance, an umbrella body that represents national sports organisations in Britain, raised concerns about how the Scottish independence referendum, which took place on 18 September 2014, would affect sport funding and recognition issues for Scottish athletes who aim to compete at the Olympic Games. Nick Skelton, the show jumper, participated at his seventh Olympic Games, a record for a British competitor. He celebrated this achievement by becoming the first British rider to win an individual gold medal in jumping. The team included seven sets of siblings: Alistair and Jonathan Brownlee (Triathlon), Peter and Richard Chambers (Rowing), Ellie and Rebecca Downie (Gymnastics), Callum and Derek Hawkins (Athletics), Andy and Jamie Murray (Tennis), Cindy Ofili and Tiffany Porter (Athletics), and John and Michael Whitaker (Equestrian). There were also two married couples: Chris and Gabrielle Adcock (Badminton) and Helen and Kate Richardson-Walsh (Hockey). Mark Gleghorne (Hockey) competed for Great Britain while his brother Paul competed for Ireland in the same sport. One British archer qualified for the men's individual recurve at the Olympics by securing one of three available Olympic spots at the 2016 European Championships in Nottingham. Meanwhile, another British archer was added to the squad by virtue of a top six national finish in the women's individual recurve at the 2016 Archery World Cup meet in Antalya, Turkey. Great Britain secured a place in all relay events with the exception of the men's 4 × 100 m relay based on the team's performance at the 2015 IAAF World Relays, before securing a place in the final relay in July 2016 by their position in world rankings. British athletes have so far achieved qualifying standards in the following athletics events (up to a maximum of 3 athletes in each event): The team nominated its athletes with an entry standard for the individual events based on the results at the British Championships, scheduled to take place in Birmingham between 24 and 26 June 2016. On 24 April 2016, the top two finishers in both the men's and women's 2016 London Marathon won automatic places for Team GB at the Olympics. Two days later, British Athletics confirmed four athletes, and added Derek Hawkins, brother of Callum to the men's marathon, and race walker Dominic King to the 50 km walk. On 21 May 2016, the Great Britain trials were held for the 10,000 metres, with two places in both the men's and women's races available to the first two across the line, if they had the qualification time. In the women's race, Jess Andrews won in the qualification time, while Beth Potter, who already had the time, came second and also earned a place in Rio. Mo Farah, reigning World and Olympic champion at 5000 and 10000 metres, has been preselected by Great Britain for both men's races. Neither of the first two finishers in the men's race had at that point achieved the qualifying standard, but on 11 June 2016, Ross Millington, who won the trial, managed to also beat the standard, thus confirming his Olympic place. On 29 May 2016, Katarina Johnson-Thompson achieved the qualification mark in heptathlon at the Gotzis meeting, the designated Olympic trial for Great Britain, joining the pre-selected Jessica Ennis-Hill in that event. Following the end of the qualifying period on 11 July, a total of 80 athletes (41 men and 39 women) were officially named to Team GB's track and field team for the Games. Apart from Ennis-Hill and Farah, notable athletes also featured defending Olympic long jump champion Greg Rutherford, two-time medalist Christine Ohuruogu, high jump bronze medalist Robbie Grabarz, Sudanese-born sprinter Rabah Yousif, and long-distance stalwart Jo Pavey, who is set to compete at her fifth Games in the 10,000 metres. * : Seb Rodger originally advanced as the last of the 'fastest losers' to the semifinal, but was excluded after a successful appeal by another runner against disqualification. ** : Charlie Grice was reinstated for the semi-finals following an appeal after obstruction in the heat. *** : Chijindu Ujah raced in heat but not in final. * : Kelly Massey raced in heat but not in final. Great Britain qualified a total of eight badminton players for each of the following events into the Olympic tournament based on the BWF World Rankings as of 5 May 2016: one entry each in the men's and women's singles, and a pair in the men's, women's, and mixed doubles. Great Britain entered twelve boxers to compete in each of the following weight classes into the Olympic boxing tournament. Galal Yafai, Muhammad Ali, Qais Ashfaq, Joseph Cordina, Antony Fowler, Joshua Buatsi, Lawrence Okolie, and Joseph Joyce claimed their Olympic spots at the 2016 European Qualification Tournament in Samsun, Turkey. London 2012 flyweight champion Nicola Adams and fellow Olympian Savannah Marshall were the only British women to book Olympic spots, as a result of their quarterfinal victories at the World Championships in Astana, Kazakhstan. Pat McCormack and Josh Kelly secured further Olympic places for Team GB at the 2016 AIBA World Qualifying Tournament in Baku, Azerbaijan. British canoeists qualified a maximum of one boat in each of the following classes through the 2015 ICF Canoe Slalom World Championships and the Olympic selection trials, both held in Lee Valley Park. On 4 November 2015, Team GB announced the names of the four slalom canoeists selected for the Games. British canoeists qualified one boat in each of the following events through the 2015 ICF Canoe Sprint World Championships and the Olympic selection trials, held in Duisburg (18 to 19 April 2016). Under Olympic rules, the successful canoeists could also enter other events where no Team GB canoeist was separately entered. As a result, Liam Heath, a World Cup gold medalist in the K-1 200 m, would take part in that event, and this was confirmed on 14 June 2016, as well as the participation of Jessica Walker in the equivalent women's event under the same rule. On 18 July 2016, as a consequence of the disqualification of the Romanian and Belarussian squads from the Games, Lani Belcher and Angela Hannah, as highest ranked non-qualifier in the 2015 World Championships, were upgraded to a quota place in the K2-500 event. British riders qualified for the following quota places in the men's and women's Olympic road race by virtue of their top 15 final national ranking in the 2015 UCI World Tour (for men) and top 22 in the UCI World Ranking (for women). The BOA announced the eight-athlete squad of road racers (five men and three women) for Team GB on 24 June 2016. On 19 July, it was announced that Peter Kennaugh had withdrawn from the squad due to a lack of race fitness after struggling to recover from injuries sustained in May and that his place in the squad would be taken by Steve Cummings. Following the completion of the 2016 UCI Track Cycling World Championships, British riders accumulated spots in both men's and women's team pursuit, and men's team sprint, as well as both the men's and women's omnium. As a result of their place in the men's team sprint, Great Britain won the right to enter two riders in both men's sprint and men's keirin. Great Britain narrowly failed to win a quota place in the women's team sprint. As such, they did not earn the two places in women's sprint and keirin that the team quota place would have gained them. However, Great Britain did earn a single place in the women's keirin, and two places in the women's sprint, by virtue of their final individual UCI Olympic rankings in those events. Team GB's track cycling squad was officially selected for the Games on 24 June 2016, with seven-time medallist Bradley Wiggins returning to the track scene at his fifth straight Olympics. Great Britain received a spare Olympic berth freed up by Sweden from the UCI to send a mountain biker competing in the Olympic men's cross-country race. On 4 July 2016, British Cycling announced that Grant Ferguson was officially added to the cycling squad for the Games. British riders qualified for two men's quota places in BMX at the Olympics, as a result of the nation's fifth-place finish in the UCI Olympic Ranking List of 31 May 2016. Team GB selected London 2012 top 8 finalist Liam Phillips and rookie Kyle Evans to the BMX cycling team for the Games on 24 June 2016. British divers qualified for seven of the maximum of eight individual spots and four synchronized teams at the Olympics through the 2015 FINA World Championships and the 2016 FINA World Cup series. The divers who secured the places for Great Britain were not necessarily the athletes who would be selected to represent their country in these events. Instead, they needed to compete at the Olympic trials, held from 10 to 12 June 2016 in Sheffield, to book their places for the Games. A total of eleven divers (five men and six women) were officially named to Team GB on 17 June 2016, featuring London 2012 bronze medalist Tom Daley in both men's individual and synchronized platform. Great Britain became one of the first three nations to earn places at the Games, qualifying a complete team in dressage by winning the silver medal in the team event at the 2014 FEI World Equestrian Games. The Great Britain eventing team also qualified by winning a silver medal at the same event. Great Britain secured a full equestrian team for Rio when the British riders achieved one of three qualification places from the 2015 European Show Jumping Championships. British fencers qualified a full squad in the men's team foil by virtue of being the highest ranking team from Europe outside the world's top four in the FIE Olympic Team Rankings. A trio of men's foil fencers, James Davis, Laurence Halsted and Richard Kruse, along with their reserve Marcus Mepstead, were named to Team GB on 5 May 2016. In the men's individual foil Kruse came close to winning Great Britain's first medal of the Games, and its first fencing medal since the 1964 Games, finishing fourth after losing the bronze medal match to Timur Safin of Russia. Great Britain's men's field hockey team qualified for the Olympics by having reached the last four at the 2014–15 Men's FIH Hockey World League Semifinals. Only three nations qualified through this route, but India had already secured qualification as continental champions after the team's success at the 2014 Asian Games, so that the remaining teams automatically received the three quotas. The following is the Great Britain roster in the men's field hockey tournament of the 2016 Summer Olympics. Great Britain's women's field hockey team qualified for the Olympics by having achieved a top three finish at the 2014–15 Women's FIH Hockey World League Semifinals. As England also won the 2015 Women's EuroHockey tournament, Great Britain were treated as having qualified as European champions, and relinquished their Hockey World League qualification place to the highest ranking non qualified team, India. The following is the Great Britain roster in the women's field hockey tournament of the 2016 Summer Olympics. Great Britain entered four golfers (two per gender) into the Olympic tournament. Justin Rose (world no. 11), Danny Willett (world no. 9), Charley Hull (world no. 27) and Catriona Matthew (world no. 63) qualified directly among the top 60 eligible players for their respective individual events based on the IGF World Rankings as of 11 July 2016. Great Britain qualified a full squad of five gymnasts in both the men's and women's artistic gymnastics events through top eight finishes in the team all-around competitions at the 2015 World Artistic Gymnastics Championships in Glasgow. BOA announced the men's and women's artistic gymnastic squads, highlighted by London 2012 medalists Louis Smith and Max Whitlock, for the Games on July 12, 2016. Great Britain qualified two gymnasts in the women's trampoline by virtue of a top eight finish at the 2015 World Championships in Odense, Denmark. Meanwhile, an Olympic berth was secured in the men's event by Nathan Bailey, who finished in the top six at the 2016 Olympic Test Event in Rio de Janeiro. Great Britain qualified a total of seven judokas for each of the following weight classes at the Games. Six of them (McKenzie, Oates, Smythe-Davis, Schlesinger, Conway, and Powell) were ranked among the top 22 eligible judokas for men and top 14 for women in the IJF World Ranking List of 30 May 2016, while Benjamin Fletcher earned a continental quota spot from the European region as Great Britain's top-ranked judoka outside of direct qualifying position. Team GB officially announced the judo team on 16 June 2016. British athletes qualified for the following spots to compete in modern pentathlon. If more than two competitors qualified in either the men's or women's event, selection for the two places available to each gender was to be made by the British Olympic Association in conjunction with Pentathlon GB. Freyja Prentice became the third British woman to qualify for Rio as a result of her world ranking at the end of May 2016. As the two previously qualified athletes failed to guarantee their selection at the 2016 World Modern Pentathlon Championships, the choice of which two women would go to the Games was determined by the selectors before the team was named on 8 June; in the event, London 2012 silver medalist Samantha Murray and rookie Kate French were selected. * Promoted following the disqualification of a higher-ranked modern pentathlete for doping. Great Britain qualified twelve out of fourteen boats for each of the following rowing classes into the Olympic regatta, with the majority of crews (except women's single & quadruple sculls) having confirmed Olympic places for their boats at the 2015 FISA World Championships in Lac d'Aiguebelette, France. They also had to have competed at the British Rowing Olympic Trials in Caversham (March 21 to 23) to assure their selection to the Olympic team for the Games. A total of 43 rowers were officially named to Team GB's Olympic squad on June 9, 2016, with double silver medalist Frances Houghton aiming to appear at her fifth Olympics and London 2012 bronze medalist Alan Campbell racing in the single sculls at his fourth. The crew also featured reigning Olympic champions Helen Glover and Heather Stanning from the women's pair, and two-time gold medalists Pete Reed and Andrew Triggs Hodge from the men's four. A squad of twelve rowers, not including cox Phelan Hill was announced for the men's eight; Team GB announced at the same time that the men's pair, and two 'spares' or reserves, would be selected at a later date from those members of the twelve that were not seated in the largest boat. Following the breaking up of the women's double sculls partnership of Katherine Grainger and Victoria Thornley, and their failure thereafter to make the women's eight squad, the double sculls was also not announced, although selector David Tanner confirmed later that evening that the pair of Grainger and Thornley would be selected. In international competition the constituent nations of Great Britain ordinarily compete as separate unions representing England, Scotland and Wales. Northern Irish players who normally represent Ireland would have been eligible however the IRFU insisted that they do not play for Great Britain. For the purposes of qualification for the 2016 Olympics the three British unions agreed in advance of the 2013–14 men's and women's Sevens World Series that their highest-finishing teams in that season would represent all three unions in the first stage of qualification during the 2014–15 series. The England men's and women's teams earned the right to represent the British unions in that stage of their respective competitions. The England men's team secured a qualifying berth for Great Britain at the Olympics by having achieved one of the top four places in the 2014–15 Sevens World Series. The following is the Great Britain roster in the men's rugby sevens tournament of the 2016 Summer Olympics. The England women's team secured a qualifying berth for Great Britain at the Olympics by having achieved one of the top four places in the 2014–15 World Rugby Women's Sevens Series. The following is the Great Britain squad in the women's rugby sevens tournament of the 2016 Summer Olympics. Great Britain qualified one boat for each of the following classes at the 2014 ISAF Sailing World Championships, bringing the maximum quota of 15 sailors, in ten boats. The sailors who secured the quotas for Great Britain were not necessarily the athletes who would be selected to represent their country in these events. On 9 September 2015, Team GB announced the names of the first six sailors to be selected for places at the Rio 2016 regatta. Five more sailors were added to the list of confirmed athletes for Rio on 8 March 2016, with the windsurfer Nick Dempsey appearing at his fifth Olympics. The men's 470 (Patience & Grube) and 49er (Fletcher & Sign) crews completed the Team GB's sailing lineup for the Olympics on 4 May 2016. British shooters achieved quota places for the following events by virtue of their best finishes at the 2014 and 2015 ISSF World Championships, the 2015 ISSF World Cup series, and European Championships or Games, as long as they obtained a minimum qualifying score (MQS) by March 31, 2016. On 10 November 2015, Team GB announced the names of the six sport shooters to compete at the Games. British swimmers achieved qualifying standards in the following events (up to a maximum of 2 swimmers in each event at the Olympic Qualifying Time (OQT), or potentially 1 at the Olympic Selection Time (OST)): All British swimmers had to qualify by finishing in the top two of the Olympic trials having gained the GB qualifying A standard set by British Swimming in the relevant final (that time being the fastest time of the sixteenth fastest swimmer internationally in that event in 2015). Great Britain secured its first spot for Rio 2016 when Jack Burnell finished fifth in the 10 km open water marathon at the 2015 FINA World Championships. Meanwhile, in the pool, British swimmers earned places for Rio in all the relay events at the same meet with the exception of the women's 4 × 100 m freestyle relay; therefore, they will rely on the ranking times for one of the final four places available in these events. On 21 April 2016, British Swimming announced the final squad of 26 swimmers for the Olympics. Among them were 2015 World champions Adam Peaty and James Guy, Commonwealth champion Jazmin Carlin, and incoming three-time Olympians Robbie Renwick and Hannah Miley. * – Indicates athlete swam in the preliminaries but not in the final race. Qualifiers for the latter rounds (Q) of all events were decided on a time only basis, therefore positions shown are overall results versus competitors in all heats. Great Britain was able to submit a squad of two synchronized swimmers to compete only in the women's duet, after picking up one of four spare berths freed by the continental selection for being the next highest ranking nation at the FINA Olympic test event in Rio de Janeiro. Katie Clark and Olivia Federici, who were both part of the Great Britain lineup for the team event at the 2012 Games, were confirmed as the British representatives in May 2016. Great Britain qualified a team of three athletes for the table tennis competition at the Games. London 2012 Olympians Paul Drinkhall and Liam Pitchford were automatically selected among the top 22 eligible players in the men's singles based on the ITTF Olympic Rankings. On 3 June 2016, Sam Walker was named as the third member of the Great Britain team, with Tom Jarvis also named, as travelling reserve. Great Britain fielded a squad of four athletes into the taekwondo competition at the Olympics by finishing in the top 6 of the WTF Olympic rankings in their respective classes. Defending Olympic champion Jade Jones, and former World and reigning European champion Bianca Walkden qualified automatically for their respective weight classes. The quota secured in the men's 80 kg category could be allocated to either Lutalo Muhammad or Damon Sansum, and was at the discretion of British Taekwondo in collaboration with the British Olympic Association; in the event, the higher ranked Muhammad got the nod on 22 June 2016. The remaining British spot was awarded to Mahama Cho in the men's heavyweight category (+80 kg) by virtue of his top two finish at the 2016 European Qualification Tournament in Istanbul, Turkey. Great Britain entered four tennis players into the Olympic tournament. Reigning Olympic champion Andy Murray (world no. 2), along with returning Olympian Heather Watson (world no. 56) from London 2012 and rookie Johanna Konta (world no. 18), qualified directly among the top 56 eligible players for their respective singles events based on the ATP and WTA World Rankings as of 6 June 2016. Murray also teamed up with his older brother Jamie in the men's doubles by virtue of the latter's top-10 ATP ranking. On 1 July 2016, the International Tennis Federation announced that further places would be allocated to Kyle Edmund in the men's singles, and the pair of Colin Fleming and Dominic Inglot in the men's doubles. British triathletes qualified for the following events at the 2016 Olympic Games. Gordon Benson secured a quota in the men's triathlon event as a result of winning the gold medal at the 2015 European Games, while Non Stanford and Vicky Holland added two more quotas to the British team in the women's triathlon event by finishing second and third at the ITU World Qualification Event in Rio de Janeiro. Stanford and Holland then assured themselves places on the British team in accordance with the selection criteria set by the British Triathlon Federation, by finishing second and third in the ITU World Triathlon Grand Final in Chicago. Two times world champion Helen Jenkins was confirmed as the third British athlete for the women's event over Commonwealth Games champion Jodie Stimpson, following victory for Jenkins in the World Triathlon Series event in Gold Coast, Australia, used by Great Britain as a selection event, and brothers Alistair and Jonathan Brownlee, who both won medals at the previous Games, were chosen for the men's event. European Games gold medalist Gordon Benson was the last triathlete to be selected for the Games on 7 June 2016, selected to fill the quota place he had won for Great Britain at those Games. Great Britain qualified one male and one female weightlifter for the Rio Olympics by virtue of a top seven national finish (for men) and top six (for women), respectively, at the 2016 European Championships. The team were required to allocate these places to individual athletes by 20 June 2016. First-time Olympians Sonny Webster and Rebekah Tiler were named to Team GB's weightlifting team for the Games on 29 June 2016. Neither the men's nor the women's team qualified. Following the appearance of a British team in both the men's and women's tournaments as the nation hosted the 2012 Summer Olympics in London, the Football Association initially indicated it was unlikely that a men's team would be entered to take part in the Rio Olympics as the component nations of Great Britain were to compete separately in the men's 2015 European Under-21 Championship which acted as the qualifying competition. However, in February 2015, the FA indicated a change in its policy, championed by Gareth Southgate, the England under-21 coach, who held the view that, as the only global tournament for that age group (there is no FIFA under 21/under 23 World Cup), the Olympic tournament would provide valuable experience for the players. As a consequence, the FA indicated its willingness to the BOA to run a men's team for the Olympic Games. England women's national football team qualified for the 2015 FIFA Women's World Cup but is not an Olympic member nation, as they are part of Great Britain. Although England were one of the top three European teams, the last Olympic spot went to the fourth-best UEFA team. The Football Association had originally declared on 2 March 2015 its intention to enter and run teams on behalf of the British Olympic Association at the 2016 Olympics should England qualify. However, following strong objections from the Scottish, Welsh and Northern Irish football associations, as well as a commitment from FIFA that they would not allow entry of a British team unless all four Home Nations were in agreement, the Football Association announced on 30 March 2015 that they would not seek entry into the Olympic tournament. Team GB did not qualify. Team GB had no qualified teams. Great Britain did not qualify any athletes. ^ "Andy Murray named as Flagbearer for Rio 2016 Opening Ceremony". British Olympic Association. Retrieved 3 August 2016. ^ "Athletics Ireland defends decision to reject 'all Ireland' motion". Irish Times. Retrieved 18 August 2016. ^ "Four NI players in Great Britain men's squad for Rio 2016". BBC Sport. Retrieved 6 September 2016. ^ British Virgin Islands, Bermuda and Caymen Islands all have their own representation at the Olympic Games. These NOCs predated the rule restricting IOC membership to sovereign states. ^ In the cases of Proctor and Williams, both athletes had, in fact, transferred their allegiance directly to Great Britain and Northern Ireland under IAAF rules, which allow for separate teams from crown dependencies. ^ "Britain becomes a 'sporting superpower' after Olympic success in Rio". The Independent. 21 August 2016. Retrieved 22 August 2016. ^ "Great Britain on brink of historic record at Rio 2016 as lottery funding pays dividends in Olympic medals". Rio 2016. 20 August 2016. Archived from the original on 24 August 2016. Retrieved 20 August 2016. ^ "Mark England appointed as Team GB's Chef de mission". British Olympic Association. Retrieved 29 April 2014. ^ "UK Sport targets 'best away Olympics' and 'better than London Paralympics' - UK Sport". ^ "Team GB celebrates most successful away Olympics after latest Rio 2016 medal flurry in cycling, sailing, diving and gymnastics". The Telegraph. 17 August 2016. Retrieved 17 August 2016. ^ "UK Sport reveals record investment in bid to become first nation to surpass home Games medal haul". UK Sport. 18 December 2014. Retrieved 26 August 2014. ^ "Rio 2016: Four sports suffer Olympic funding cut". BBC Sport (4 February 2014). Retrieved 26 August 2014. ^ "Rio 2016: Weightlifting only winner in UK Sport funding appeals". BBC Sport. 19 March 2014. Retrieved 26 August 2014. ^ Riley-Smith, Ben (18 August 2014). "Team Scotland could be left out of Rio 2016 after independence, UK sports bodies fear". The Telegraph. Retrieved 26 August 2014. ^ "Four NI players in Great Britain men's hockey squad for Rio 2016". BBC Sport. Retrieved 6 September 2016. ^ Aarons, Ben (13 November 2015). "British athletes will skip European Championships to concentrate on Olympics". The Guardian. Retrieved 13 November 2015. ^ "Hawkins, Samuels, Dixon and Tewelde qualify for Rio". BBC Sport. 24 April 2016. Retrieved 28 April 2016. ^ "British Athletics announce 6 for Rio". British Athletics. 26 April 2016. Archived from the original on 28 April 2016. Retrieved 28 April 2016. ^ "Scot Andrew Butchart wins Vitality London 10,000m to maintain Rio bid". BBC Sport. 30 May 2016. Retrieved 17 July 2016. ^ Lewis, Aimee (29 May 2016). "Rio 2016: Katarina Johnson-Thompson qualifies for Olympic Games". BBC Sport. Retrieved 17 July 2016. ^ "Three reigning Olympic champions headline British team for Rio". IAAF. 13 July 2016. Retrieved 17 July 2016. ^ "Ireland's Katie Taylor all set to defend her Olympic title as ten nations qualify boxers for Rio 2016 on emotional day at the Women's World Championships". AIBA. 24 May 2016. Retrieved 25 May 2016. ^ "Four Slalom Canoeists Selected for Rio 2016". Team GB. 4 November 2015. Retrieved 4 November 2015. ^ "British Olympic Association names four canoe slalom athletes for Rio 2016". Sky Sports. 4 November 2015. Retrieved 4 November 2015. ^ "Six canoe sprinters are on their way to Rio 2016". Team GB. 14 June 2016. Retrieved 15 June 2016. ^ "Lani Belcher and Angela Hannah to get late call into Olympics canoeing team". Sky Sports. Retrieved 21 August 2016. ^ a b c "Team GB's cyclists announced for Rio 2016". Team GB. 24 June 2016. Retrieved 25 June 2016. ^ Wynn, Nigel (19 July 2016). "Steve Cummings selected for Olympics as Peter Kennaugh withdraws from GB cycling team". Cycling Weekly. Retrieved 14 August 2016. ^ "Grant Ferguson added to the Rio 2016 Team GB cycling squad". British Cycling. 4 July 2016. Retrieved 5 July 2016. ^ "Team GB now have eight Rio 2016 diving berths". Team GB. 21 February 2016. Retrieved 23 February 2016. ^ Palmer, Dan (20 November 2015). "British divers to compete for Rio 2016 spots in Sheffield". Inside the Games. Retrieved 19 November 2015. ^ "Meet the diving team heading to Rio 2016!". Team GB. 17 June 2016. Retrieved 18 June 2016. ^ "Rio Olympics gets 1st qualified athletes". USA Today. The Associated Press. 26 August 2014. Retrieved 26 August 2014. ^ Williams, Ollie (31 August 2014). "World Equestrian Games: GB silver as Fox-Pitt wins bronze". BBC Sport. Retrieved 31 August 2014. ^ "Great Britain seal men's foil team berth for Rio 2016". Team GB. 7 February 2016. Retrieved 8 February 2016. ^ "Team GB fencers named for Rio 2016". Eurosport. 5 May 2016. Retrieved 7 May 2016. ^ Prior, Ian (7 August 2016). "Richard Kruse's pursuit of unlikely fencing medal for GB foiled at the last". The Guardian. Retrieved 28 December 2016. ^ "Meet the hockey squads heading to Rio 2016!". Team GB. 28 June 2016. Retrieved 28 June 2016. ^ Gilmour, Rod. "Hockey World League: Great Britain women sail away with record success and Rio jigs in Valencia". The Telegraph. Retrieved 21 June 2015. ^ "Four golfers chosen for Rio 2016!". Team GB. 13 July 2016. Retrieved 13 July 2016. ^ "Rio 2016: GB women's gymnastics team book Olympic spot". BBC Sport. 24 October 2015. Retrieved 25 October 2015. ^ McDaid, David (26 October 2015). "Rio 2016: GB men's gymnastics team secure Olympic spot". BBC Sport. Retrieved 27 October 2015. ^ "13 gymnasts book their spots for Rio 2016". Team GB. 13 July 2016. Retrieved 13 July 2016. ^ "Rio 2016: Great Britain earn two spots in women's trampoline". BBC Sport. 29 November 2015. Retrieved 30 November 2015. ^ "Seven judoka book their places at Rio 2016". Team GB. 16 June 2016. Retrieved 17 June 2016. ^ "Four modern pentathletes selected for Rio 2016". Team GB. 8 June 2016. Retrieved 9 June 2016. ^ "Eddie focused on Olympic trials". EuroSport. 16 March 2016. Retrieved 19 March 2016. ^ "Team Announcement: Meet the rowers heading to Rio 2016!". Team GB. 9 June 2016. Retrieved 9 June 2016. ^ "England nominated to qualify GB for Olympics". International Rugby Board. 11 July 2014. Archived from the original on 6 October 2014. Retrieved 26 August 2014. ^ Phillips, Mitch (16 May 2015). "Rugby-England head to Rio as team GB in sevens". London: Reuters. Retrieved 11 June 2015. ^ "Team GB Names 2016 GB Olympic Men's Rugby Team". teamgb.com. 19 July 2016. Retrieved 19 July 2016. ^ "World Rugby Sevens: England women seal GB's Olympic places". BBC Sport. 23 May 2015. Retrieved 11 June 2015. ^ "Team GB names eight sailors". BBC Sport. 9 September 2015. Retrieved 9 September 2015. ^ "Cancer treatment forces Elliot Willis to pull out of GB Olympic sailing squad". The Guardian. 8 March 2016. Retrieved 8 March 2016. ^ "Final four sailors selected to Team GB for Rio 2016". Team GB. Retrieved 4 May 2016. ^ "Six shooters selected to compete for Team GB at Rio 2016". Team GB. 10 November 2015. Retrieved 10 November 2015. ^ "Six British shooters chosen for Rio". EuroSport. 10 November 2015. Retrieved 10 November 2015. ^ "Burnett misses World medal but gains Rio 2016 named quota place". British Olympic Association. Retrieved 27 July 2015. ^ "British Swimming announce Rio squad". British Swimming. 21 April 2016. Retrieved 21 April 2016. ^ Hope, Nick (21 April 2016). "Rio 2016: Adam Peaty & James Guy in GB Olympic swimming squad". BBC Sport. Retrieved 21 April 2016. ^ Hope, Nick (6 March 2016). "Rio Olympics: GB pair earn synchronised swimming place". Team GB. Retrieved 7 March 2016. ^ "Rio 2016: Olivia Federici and Katie Clark seal GB synchronised swimming spots". BBC Sport. 1 June 2016. Retrieved 1 June 2016. ^ "Sam Walker added to table tennis squad for Rio 2016". Team GB. 2 June 2016. Retrieved 12 June 2016. ^ Hope, Nick (6 December 2015). "Rio 2016: Muhammad claims GB Olympic taekwondo place". BBC Sport. Retrieved 7 December 2015. ^ "Cho bags Team GB a final Rio quota place". Team GB. 18 January 2016. Retrieved 18 January 2016. ^ "Rio 2016: Andy Murray and Johanna Konta in Team GB Olympics squad". BBC Sport. 10 June 2016. Retrieved 12 June 2016. ^ "Baku 2015: Benson thanks teammates as he bags triathlon gold". British Olympic Association. Retrieved 15 June 2015. ^ "Non Stanford & Vicky Holland move closer to Rio Olympics". BBC Sport. Retrieved 2 August 2015. ^ "World Triathlon: Non Stanford & Vicky Holland book Rio spots". BBC Sport. Retrieved 19 September 2015. ^ "Rio 2016: Helen Jenkins secures third GB triathlon spot". BBC Sport. 22 April 2016. Retrieved 22 April 2016. ^ "Rio 2016: Great Britain secure two Olympic weightlifting spots". BBC Sport. 18 April 2016. Retrieved 30 April 2016. ^ "Two weightlifters announced for Rio 2016". Team GB. 29 June 2016. Retrieved 29 June 2016. ^ Kelso, Paul (14 August 2012). "British Olympic Association chief executive Andy Hunt criticises Football Association for lack of support". The Telegraph. Retrieved 26 August 2014. ^ "Kelly Smith laments Rio snub for GB women's football team". BBC Sport. 14 August 2012. Retrieved 26 August 2014. ^ Rumsby, Ben (2 March 2015). "Football Association attempt to resurrect Team GB men's team for Rio Olympics". Daily Telegraph. Retrieved 2 March 2015. Wikimedia Commons has media related to Great Britain at the 2016 Summer Olympics.